By ensuring that PODS containers are available in two different sizes, we offer the very best to our customers. For our unique mobile storage solution or simply secure self storage, accessible to you 24/7, our containers are designed with the customer in mind. We also have our smaller PODS storage vaults, these are perfect if you need a slightly smaller space if you’re de-cluttering or just storing a few “bits”, boxes or furniture. See more on our PODS Vault Storage here. Our storage units are built with you in mind, and we understand that everyone’s needs are different. Not just in terms of the size of storage you require, but also in relation to your schedule and budget. You may want to use one small container now and one at another point, or require one large container outside your front door by tomorrow. Either way, we’re happy to adapt our services to your needs! *The amount of space needed can vary based on the amount and size of furniture in your home and the additional goods stored in your garage, cellar, sheds and garden. Please be sure to include all of your rooms, and remember that you can stack your goods inside your PODS container. All containers are fitted with e-track so securing furniture inside the container is nice and easy. 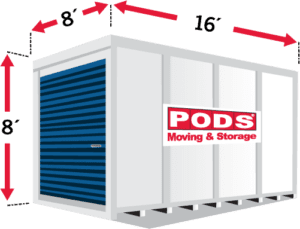 In budget terms, the smaller storage containers enable you to store the equivalent of 1-2 rooms worth of your belongings into one moderately sized PODS container at a very reasonable price. We offer good value throughout all sizes of PODS containers, and we realise that for larger sized or more cluttered homes, the 12ft and 16ft containers are the perfect sized for many of our customers’ needs. Because we deliver them to you, there is no need to hire a van as you can load straight into one of our containers at your door. Our storage units are all constructed in a way that makes self storage as easy and practical as possible, so loading your container (or having our professional removal team do it) can be done in a quick and practical fashion without unnecessary physical strain! The container is lowered to ground level and placed on the road or driveway so loading is easy as you walk your items straight in. We take just as much care when your possessions are in transit with us. PODS containers are all weather resistant, and when partially filled, have been tested to withstands 110mph winds. Our patented PODZzilla lifting system also makes certain that your contents won’t shift whilst in transit. 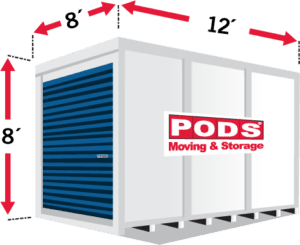 You can give our team of experts a call to discuss the right size of PODS for your needs or see our PODS storage calculator so work out the space you need.